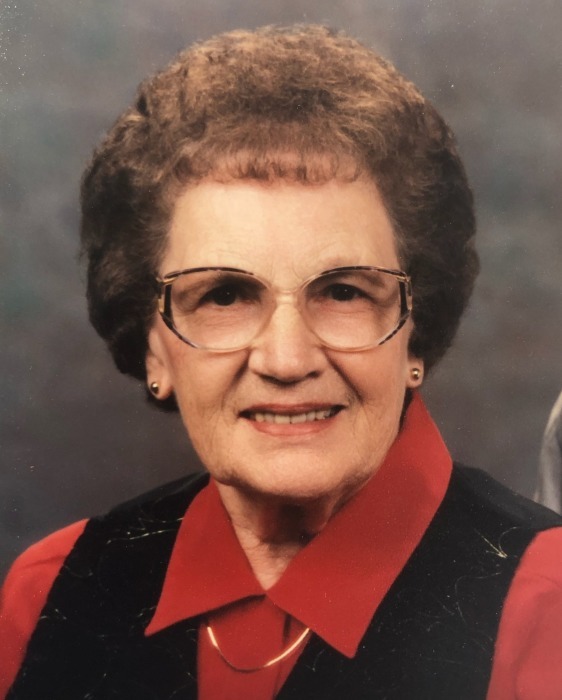 Florence Heier, 99, Jamestown, ND passed away on March, 22, 2019 at Ave Maria Village in Jamestown, ND. Florence Strehle was born January 28, 1920 at the family home located north of Streeter, ND. Her parents were Emmanuel and Barbara (Oberlander) Strehle. She attended the country school in Newbury Township. Florence married Adolph G. Dockter on December 10, 1940 in Streeter, ND. To this marriage 2 children were born, Twila June and Michael Adolph. They made their home on the Dockter family farm 8 miles north of Streeter for 14 years. In 1954, they moved into Streeter where they owned and operated a business. Following the death of her husband Adolph in 1964, she continued to reside in Streeter and worked as a cook for the Streeter School. On July 1, 1967, she married Jake Heier. They made their home on the Heier farm north of Alfred and owned and operated an Implement dealership there until 1976 when they moved their home and business into Gackle. They maintained the Implement dealership until their retirement in 1986. Following the death of her husband Jake in 2004, she continued to reside in Gackle. In 2009, Florence moved to the Heritage Center in Jamestown, ND and continued to reside there until entering Ave Maria Village in February 2019. Florence was a member of St. Luke Lutheran Church in Streeter. She enjoyed working with the church ladies, sewing, needlework and playing cards (Whist). She especially enjoyed spending time with family and friends. She is survived by 1 son, Michael Dockter, Fargo, ND; 2 grandsons, Cordell (Zina) Remboldt, Bismarck, ND; Chad (Claudia) Remboldt, Olathe, KS; 4 great-grandchildren, Cody (Cassi) Remboldt, Bismarck, ND; Allison (Jesse) Goehring, Wing, ND; Claire and Chloe Remboldt, Olathe, KS; 1 great- great-grandson, Arlo Remboldt, Bismarck, ND; and 1 sister, Genny Opp, Jamestown, ND. She was proceeded in death by her parents, husbands, daughter and son-in-law, Twila and Clayton Remboldt, 1 grandson, Scott Remboldt, 6 brothers, Eldo, Bennie, Eddie and 3 in infancy, and 2 sisters, Viola Ruff and Edna Lachenmeier. The family of Florence would like to extend their gratitude to all the Staff at Heritage Center and Ave Maria Nursing Home for their attentiveness and loving care.